She also asserted that devasthanam has made elaborate arrangements to ensure hassle-free darshan for devotees visiting the temple from various parts of the country. VIJAYAWADA: In a decision that kicked up a controversy, Kanaka Durga temple executive officer V Koteswaramma on Saturday asked the temple trust board members to have darshan of the Goddess by purchasing tickets. As per reliable sources, the EO took the decision after facing severe criticism from devotees on the first day of Dasara celebrations for according priority to VIPs for darshan putting the common devotees to inconvenience by making them wait in queue lines for long hours. The EO reportedly took the decision as some trust board members are coming to have darshan along with their relatives and friends through the VIP entrance halting the queue lines of common devotees.It is learnt that the shocked trust board members took the issue to the notice of minister Kollu Ravindra, who was present at the temple, when the trust board members were asked to purchase tickets and come in queue lines. The minister reportedly asked the trust board members not to make an issue out of the decision and asked them to cooperate with the temple administration in providing hassle-free darshan for devotees. 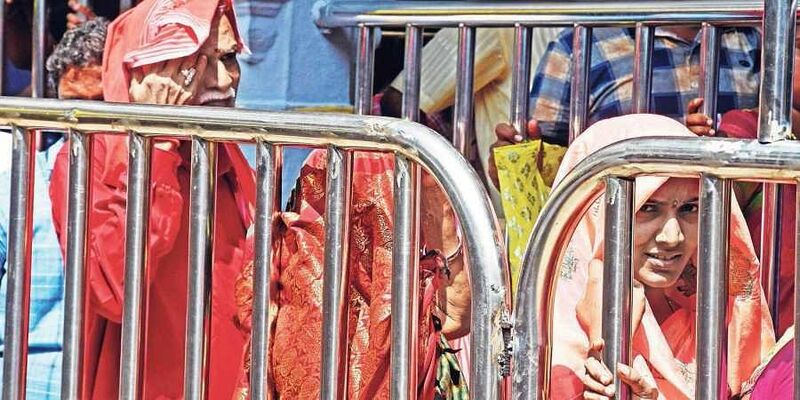 Speaking at the media point on the hill shrine, EO Koteswaramma said, “No special queue lines were arranged for the temple trust board members for darshan.” Special queues were arranged only for the VIPs, she made it clear. Koteswaramma, however, told that she does not have any disputes with the trust board members and appealed to them to extend their support in making Dasara celebrations a grand success. She also asserted that devasthanam has made elaborate arrangements to ensure hassle-free darshan for devotees visiting the temple from various parts of the country. Krishna District Collector B Lakshmikantham said that tourism department will organise food festival on the downstream of Prakasam Barrage from Sunday to offer a wide range of delicacies for devotees thronging the city during Dasara festivities.